Lisburn Distillery are waiting to hear if new boy Aaron Callaghan is eligible to play in their Europa League match against FC Zestafoni on Thursday. The Northern Ireland Under-21 defender completed his transfer from Dungannon Swifts to New Grosvenor at the weekend. New Whites boss Jimmy Brown said they hoped to have everything confirmed with the Irish FA on Monday morning. Callaghan played in Distillery's 2-0 pre-season friendly win over Banbridge Town on Saturday. The Europa League match will be staged at Mourneview Park in Lurgan, kick-off 1945 BST. 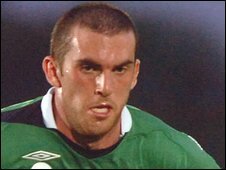 Brown's other close signings include Linfield striker Glenn Ferguson, Glentoran defender Philip Simpson and Drogheda United midfielder Gavin Whelan.